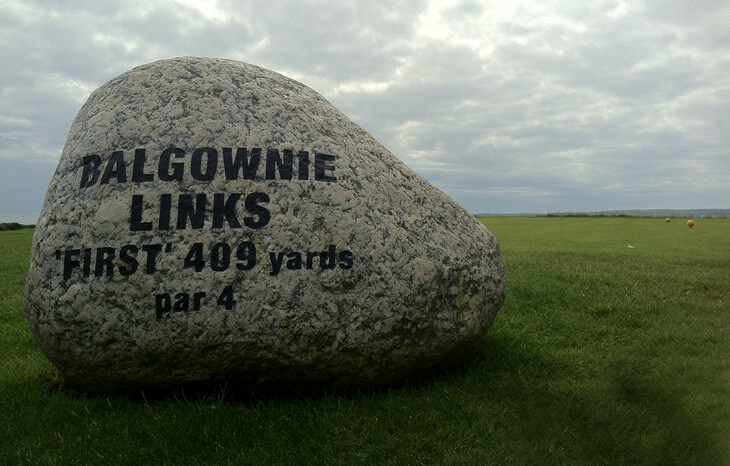 At 6,861 yards the Balgownie course at Royal Aberdeen is not long by modern standards, but it serves up a host of challenges as it makes it way along the North Sea coastline. The course was originally designed by Archie and Robert Simpson from Carnoustie and later lengthened and re-bunkered by the legendary James Braid. Having hosted the 2011 Walker Cup and the 2005 Senior British Open, the Balgownie links played host to my visit recently, and I was eager to see how the links merit such high praise. A short drive from the bustling shops and industry of Aberdeen, Royal Aberdeen Golf Club is located on the coastline just north of the city. The recognizable clubhouse sits up high with stunning views over the North Sea. The first tee awaits golfers just a few yards from the bar. I have been fortunate enough to play most of the great links courses in the UK, yet I'm not sure many opening tee shots compare with Royal Aberdeen. Shielded from the wind, under the shadow of the clubhouse, you tee your ball up no more than 15 yards from the bar inside the clubhouse. With members and guests watching on, you hope to start what is a very challenging opening stretch with a solid tee shot. Anyone who visits Royal Aberdeen will likely arrive having heard many superlatives describing the opening stretch of holes. Many may be prepared to be underwhelmed by what it has to offer. All, typically, leave truly overwhelmed and impressed by the challenge, look and character of front nine. A wide variety of holes, shots and challenges await golfers as you make your way through the vast sand dunes that guard the North Sea coastline. The par-4, par-5 (above), par-3 opening is truly one of the finest opening three hole stretches in golf. The remainder of the front nine stretches north up the coast, between humps and bumps covered with thick, deep, links rough. Show up on a day with a southern wind, and you'll be happy to use up all your strokes by the turn. The par-3 8th hole, seen below, is the signature short hole of the course. As the only hole on the front nine that plays back towards the clubhouse, it can often be hard to choose the correct club. Miss the green on this short hole and chances are you will find one of the ten bunkers guarding its surroundings. The long par-4 ninth hole, aptly named "End", completes the grand opening half as it winds it way through the dunes, up the hill, to the far corner of the property. A sliced tee shot on the 10th will put you on the neighbouring Murcar Links, where guests have been known to walk from one course to the next, playing 36 holes before realizing their error. The back nine plays more inland than the front, making its way along the top plateau of the course along flatter terrain. It is 250 yards shorter and more generous off the tee than the front nine, and can often feel even shorter with the prevailing south-west wind. Whilst the front nine has remained largely untouched for years, the back nine has undergone some minor changes in recent years to lengthen the course and make it more accommodating to large scale events. The 12th, 13th and 15th holes have seen the majority of the changes, with new tees being added and modified and an all-new green on the 15th. 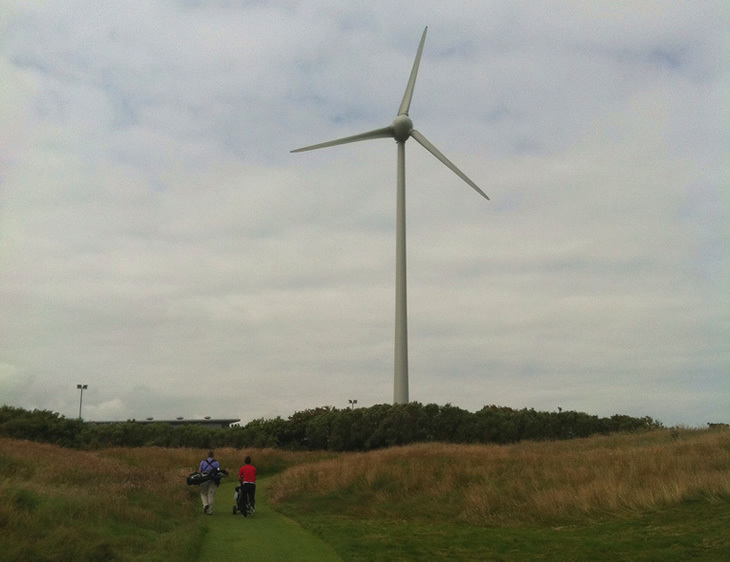 One nearby alteration that has caused a lot of discussion in the club is the wind turbine located by the 14th tee. Built by a neighbouring engineering firm, the turbine was installed without the consent of Royal Aberdeen and caused uproar within the club. To be honest, it didn't bother me at all and provided a useful line on a couple of tee shots around the turn. The final four holes at Royal Aberdeen are sure to leave you with plenty to discuss in the 19th. The short, dogleg par-4 15th hole offers long hitters the chance to get with a pitch of the green, with a hole island bunker guarding the front of the green. Next up the 16th is a longer par-4 that appears frustrating straight forward on the tee, but with a typically strong wind can prove to be quite the challenge. The iconic par 17th (below) is a hole you will remember however you play it. As the only hole on the course that plays towards the coastline, it often faces a crosswind that can make hitting the two-tier, well-guarded green a real challenge. I have played this hole several times and hit every club from a 9-iron to a 3-iron. A three here is never a bad score. 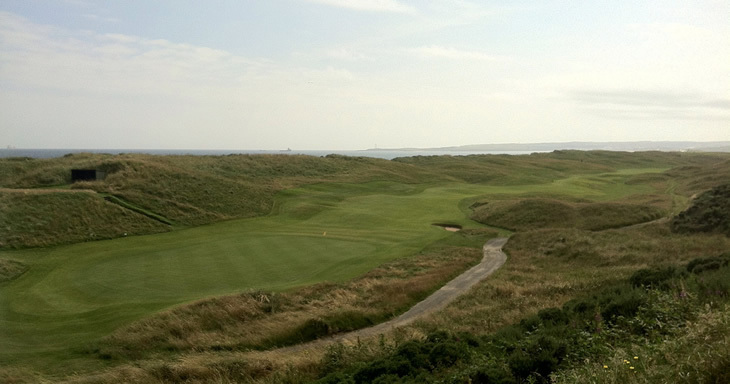 As with all authentic, old-style links courses, a strong finish is required and Royal Aberdeen doesn't disappoint. A relatively long par-4 awaits you on the 18th, typically playing into the wind and guarded by gorse bushes on both sides of the fairway. An testing uphill second shot will hope to find the large green that sits in front of the pro shop. In my opinion, Royal Aberdeen is a genuine, testing links adventure and should be rightfully included in the list of the UK's best links courses. The setting along with the typically blustery conditions and 92 bunkers may make it hard to concentrate on your score, but rest assured you'll be left impressed by the character of the course. The back nine may not live up to the front nine in terms of look and design, but the final four holes are sure to complete an enjoyable round for all who visit. In all my visit to Royal Aberdeen I have been more than impressed with the service and friendliness of the staff. It is a trait of this part of Scotland and you won't leave the clubhouse without hearing a story or two from the more than 200 years of club history. 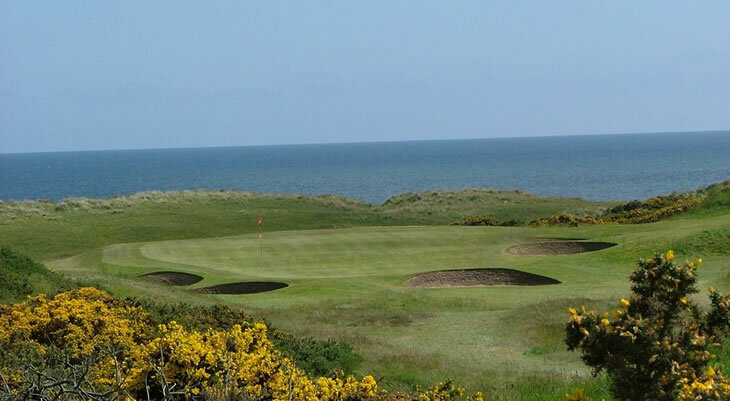 For those interesting in playing Royal Aberdeen's Balgownie Links, visitor rates range from £70 in the winter to £140 in peak summer months, and it is worth noting the club requires a handicap of 24 or under.